This is an interesting article on how to clean a hardwood floor that addresses and outlines the steps and supplies required to wet abrade a wood floor in preparation of refinishing with a seal. These steps are relatively easy to perform as long as you have the proper equipment. However, we know that wood floors can be tricky when it comes to how to clean a hardwood floor as it applies to refinishing preparation. We will address the actual refinishing process in another article. This discussion strictly addresses the wet abrasion process. There is a dry process that will be addressed in a future article. If you are more interested in floor preparation using the dry screen process, please click on the following link (Clean Wooden Floors – Preparing for Refinishing – Commercial). Personal Protection Equipment – Gloves, Dust Mask, Eye Protection, Etc. Place “Wet Floor” signs and/or barriers. Set up equipment and prepare cleaning solution. Dust mop floor with untreated mop to remove surface dust, removing adhered debris using a blunt plastic putty knife. Using an auto scrubber, use maroon pads on red pads. Fill the solution tank of the auto scrubber with undiluted Tacking Solution. In the event you are using a 175 rpm swing machine use with a maroon pad on a red pad. Fill mop bucket with undiluted Tacking Solution. Lay maroon pads in a pattern of 10’ x 50’ rectangles across the floor. Set scrubber to the minimum flow rate and maximum pad pressure and move machine slowly with overlapping passes, 500 square feet at a time. Do not over scrub the floor. If using swing machine, apply the undiluted Tacking Solution directly to floor in a 10’ x 50’ section and wet scrub with overlapping passes. If using a 175 rpm swing machine, immediately pick up solution with wet/dry vacuum. Change pad every 500 square feet after flipping the pad after every 250 square feet. Repeat process until entire floor is scrubbed. Make sure that all edges and corners are scrubbed. Using the auto scrubber, clean the floor using blue pad with clean rinse water in the solution tank. Be sure not leave footprints or wheel marks on the floor. If you are using a 175 rpm swing machine clean the floor with blue pad after applying clean rinse water to the floor. Be sure to pick up the rinse water from the floor immediately with a wet/dry vacuum. Make sure you change the rinse water often if you are using a 175 rpm swing machine and mop and bucket to rinse the floor. The floor should look dull with no shiny spots. Repeat the wet abrasion cleaning process if any shiny spots remain on the floor. 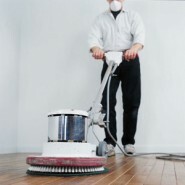 Using a vacuum remove dust from confined areas like edges and corners. Once the floor is uniformly dull, tack the floor with a push broom and towels/cloth dampened with a Tacking Solution. Repeat tacking until floor is clean and dust free being sure to cover the entire floor including edges and corners. Allow the floor to dry completely for 30 minutes before applying finish being sure to applying finish to the wood floor within 2 hours of tacking.